Here's me with the finished PLA minimug, and the Darwin that made it. Oh, and a rather fine bottle of Ballantine's 30 year old scotch. There now appear to be two 1.0 Darwin RepRap's in existence. 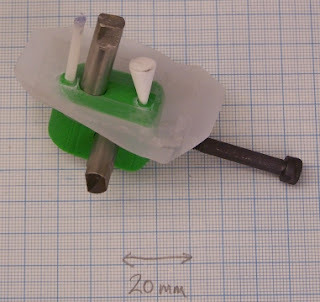 I've started trying to make RepRap parts with it, but being single-material it can't make them all just yet. And the Darwin produces a minimug; well, nearly. It's not watertight and has a lot of stringy bits in it. Not far off though. The Z axis is starting to smooth out a bit and the extruder is behaving very well now, if a little slower than I'd hoped. Must also pay some attention to family this weekend. The extruder now purrs like a kitten with no feed issues whatsoever. The extra switch (red DPDT above large fan) is so I can switch the thermistor between the controller and my meter when calibrating. My extruder heater just went orange and popped - just after I sent my spare to Adrian! No, Adrian, don't rush it back - I need to build another anyway :) Still, it goes no more. Fair enough; it's an elderly specimen and I can do better. 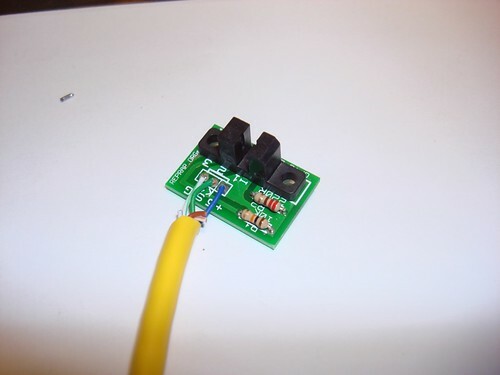 I also know to use a 20% lower resistance than specified for the standard extruder heater, as it won't quite work with PLA on a real 12V supply (it needs 14V). A small bit of background: It's made from "pelican wire" without secondary insulation, if I recall correctly. I checked with a multimeter and it's not a short to the barrel. Might have to go back to BBQ paint and standard wire for PLA. 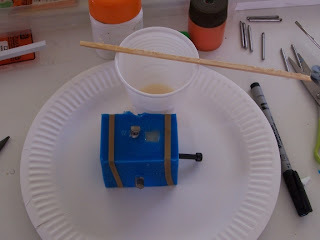 I darned well blew another extruder motor. Even though it had a nice CPU fan on it to cool it down, it still popped. 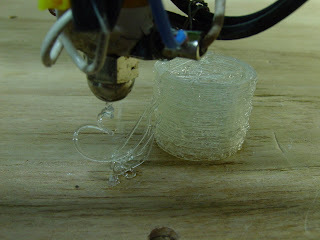 I am pushing PLA here, not the standard CAPA filament, so the equipment abuse factor is fairly high. Fortunately, Forrest has been kind enough to supply me with several motors from his collection, so I'll strap in a beefier one and see if I can get pumping the PLA again. I've squished more CAPA over the bearings to hold them in place, and at least they don't seem to be twisting around into the filament any more. I am generating quite a bit of PLA dust though! I've got my Darwin printing in PLA. I had to fiddle the software a bit - reinstate Z-axis speed, and add some bits to ignore ludicrous temperature values. 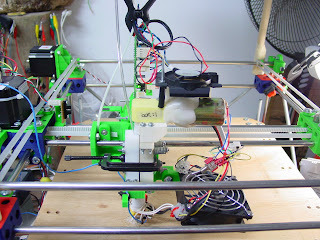 Hardware required more fiddling: I Fitted a fan over the extruder motor to keep it cool as PLA needs a lot of driving. 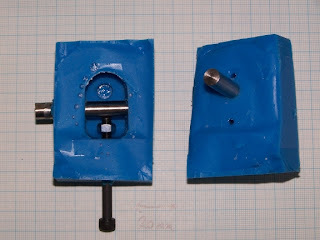 I used a half-round file to sharpen up the thread on the extruder drive, and I've added the dangly filament holder. I tried doing another PLA flask, but the extruder jammed after 5 layers. I think the bearings are rotating and digging in to the filament. Might need to make new ones. Some have complained that the posts here are somewhat sporadic and they'd like to read more, and I agree with them. 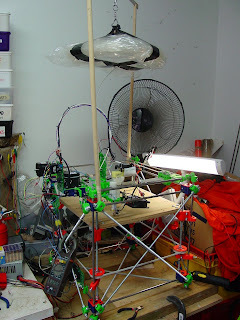 It can give the illusion that we aren't working very hard, when in fact we are working very hard on RepRap. So hard that sometimes we don't have time to post on the blog. We're going to try and change that by ideally posting once a day with something that has changed, or been worked on. Today, I updated the Opto Endstop documentation page. It's almost complete, I just need to take a couple more pictures, and write up some testing info to go along with it. It's a pretty basic page, but now it is much nicer and up to date with the current project status. 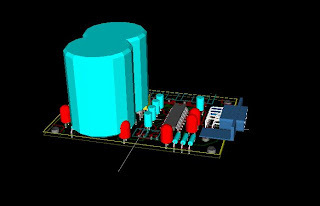 We've been working on the design for the PowerComms v1.3.0 board for a few weeks now. Once the design was to a stable state, the RRRF ordered a small batch of boards from our PCB house. We got 20 boards back, and I'd like to offer these boards (for free!!!) to people interested in helping out with the project. These are only the PCB's, and you'll have to pay for shipping, as well as the components to put in them, but hey... you're getting a free PCB!! For more information, check out the RRRF store detail page. If you want one, simply buy it from the store. We hope that you contribute back to the project with build pictures, documentation, and by testing. You're not required to, but we'd sure as heck appreciate it. For ages (sorry) the extruder's temperature measuring function hasn't been working properly, giving dud low readings intermittently. I spent the weekend working on the code and have improved both the Java end and the PIC C end. (I have updated both in the svn trunk and also updated Simon's autoconf-firmware branch). The Java now takes a majority vote between the last three temperature measurements; this reduces the impact of isolated dud measurements (the temperature can never really change very fast, because of thermal inertia). The PIC C code now detects when the capacitor charge/discharge timings are interrupted and discards such measurements, only keeping clean ones. Unfortunately, with largish capacitors, the measurements are always interrupted because of the times taken to charge and discharge, so this means reducing the capacitor otherwise one never gets a reading... For the standard thermistor (beta = 3480; Rz = 29K) this means a capacitor of 10nF. I have modified the calculator in the wiki to put in a fudge factor to give this and have changed the extruder controller PCB wiki page to say this, but more thought there is needed. I have reduced the frequency of the heater PWM interrupts by reducing the value of HEATER_PWM_PERIOD from 255 to 253 'to calm things down'. I have set the main loop so that it doesn't call the temperature measuring function each time round, as that used to mean that the PIC spent all its time in that function, making large the probability that it would be interrupted and cause trouble*. The heater pwm function now sets a flag, and the temperature measurement function just gets called once after that flag is set. (Having the function instead called as a result of the heater pwm interrupt would cause further trouble, I suspect, so I didn't do that, even though it's more obvious.) 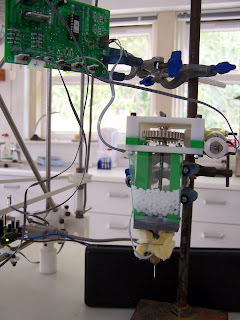 This means that the extruder PIC spends most of its time spinning in its main loop waiting for something to happen. 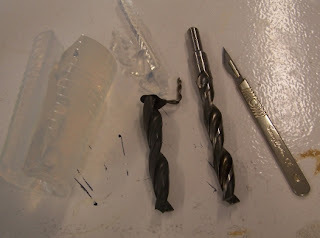 I probably won't use a drill as the master finally (it's pitch is too coarse, and you have to turn it anti-clockwise, which tends to loosen things), but this shows that you can cast from virtually any helical shape to get what you want. I was so impressed by the EVA-granule extruder made by Timothy Nixon and Adrian Tan of the School of Mechanical Engineering, University of Adelaide, Australia for Fab@Home (see this link) that I decided to revisit something Forrest and I did almost two years ago (see the blog for Friday, February 17, 2006), nick extra ideas from the Aussies, and have a go at designing one for RepRap to work with polycaprolactone. The advantage is, of course, that all thermoplastic polymers are available in bulk at very low cost in granules - it's the standard form. 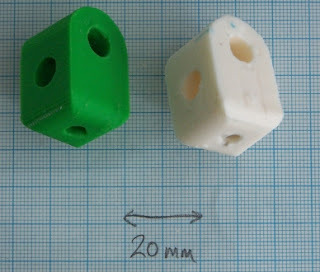 Getting 3mm filament (which is what RepRap currently uses) is not difficult - many companies will do it - but it does add slightly to material costs. 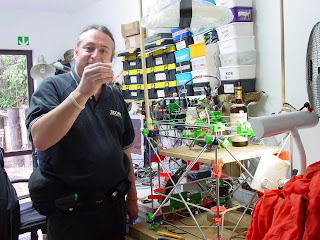 You can find details on the RepRap wiki here. It needs more work, but it'd definitely be a useful addition. I have just made an Art of Illusion version (right) of the design for the new quick-change extruder from SolidEdge (left - SE can't get its triangle normals right...). I have simplified some features, but it is functionally identical. The good news is that it was really quick and easy to do. 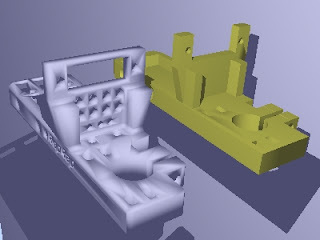 I just imported the STL file out of SE that we used to make it into AoI, coloured it a stand-out colour (unlike the picture above), dragged out a bunch of blocks and cylinderes to the same size (really easy if you zoom in - you can get the accuracy much better than the 0.1 mm or so that is needed), then booleaned them together. (Check out the latest zip file of Cartesian Bot.) All you need is a computer with Art of Illusion running on it.